Welcome to Oxford at The Ranch, an upscale community of apartments in Waller, Texas. Our modern yet timeless apartment community provides the retreat from everyday life that you have been searching for along with a list of five-star amenities to match. Our spacious one, two and three-bedroom apartments come fully equipped with large walk-in closets, in-unit washer and dryers, private patios and balconies, and much more. Exercise on-site in our updated fitness center or shoot a round of pool in our resident lounge. When you reside in our upscale community, you are treated to the best of the best. It is no surprise that you will find everything you need to live well at Oxford at The Ranch! Click the "Contact" tab at the top of the page to inquire further. 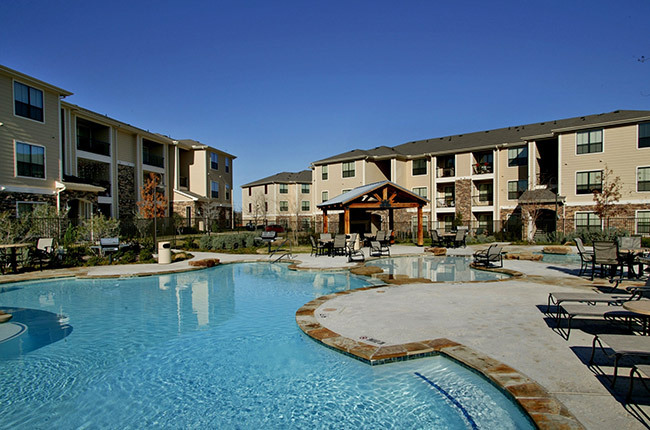 Oxford at The Ranch provides residents with luxury apartments and endless convenience. Located 45 minutes from Houston, our apartment community merges the best of urban and suburban life for an optimal apartment living experience you will not find anywhere else. Right off of Highway 290, our residents enjoy a simple commute to and from Houston, The Woodlands, Katy, Sugar Land, and more. In terms of area comforts, we are only minutes from many options for dining, recreation, and shopping. Enjoy authentic Mexican fare at Cielito Lindo or begin your morning with a smile at Breakfast Paradise or Shipley’s Donuts. Spend a day shopping at Houston Premier Outlets, which is only 15 minutes away. As far as "comfort in the country" is concerned, there’s no better option than the upscale apartment homes of Oxford at The Ranch.